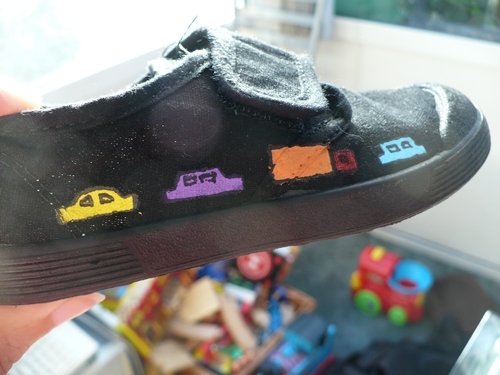 Oscar has to have plimsolls to change into when he gets to nursery. 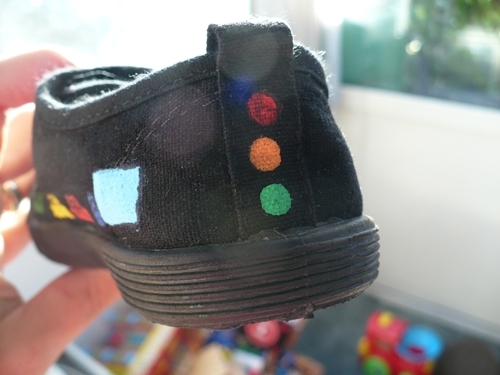 A lot of kids have funky ones like doodles, but this mean mummy bought the £2 a pair black kind. I decided to brighten them up a bit and this morning when he took them to nursery he was the envy of the playroom! Get painting! obviously for us it had to be a car motif, which is lucky as I’m not sure I could paint dinosaurs or pirates or super heroes! (Good luck with that if your little one is into those things!) I guess you could try pencilling on first, but I didn’t have much luck making that show up so I just went for it! 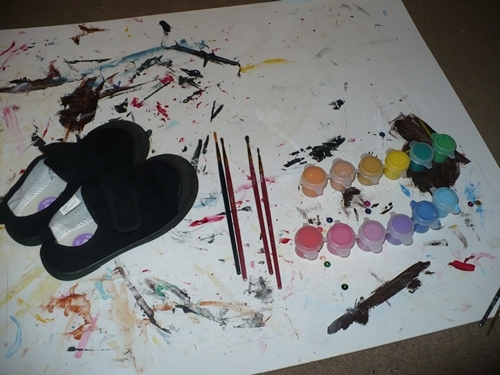 The first layer of acrylic paint tends to soak in a bit so you’ll need more than one coat. I did work out though that the paint doesn’t need to be all the way dry at all before splurging the next lot on top. Some Colours needed more layers than others and not the ones you’d expect. Red had loads of coats yellow only 2. 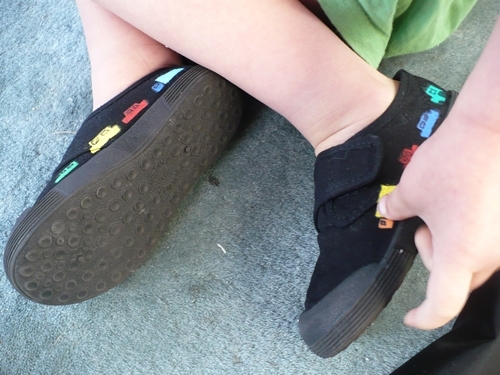 I carried on util I had little traffic jams down each side of the shoes. As you can see I have a short attention span so some other vehicles crept in among the cars. Then I spotted there’s a reinforcement strip running down the back of the shoe. This made the perfect traffic lights. If I had spotted it at the beginning I’d probably have had the cars all facing towards the traffic light in their traffic jam! After all the paint was dry I outlined the cars in sharpie and added window details and I was done! This morning a certain small boy tried them on and loved them! However, I was required to draw on wheels. 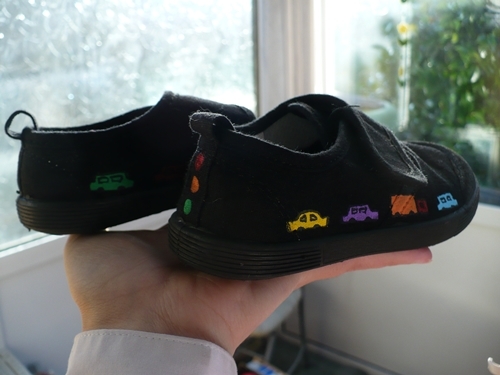 “But they wont show because the plimsolls are black.”, I replied. 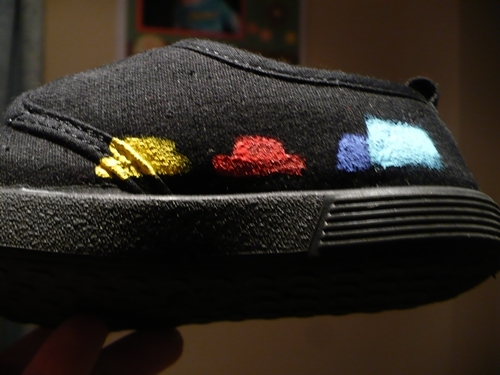 I actually tried to do this once, but I ruined a pair of white shoes. I think your idea of starting with black is much better. 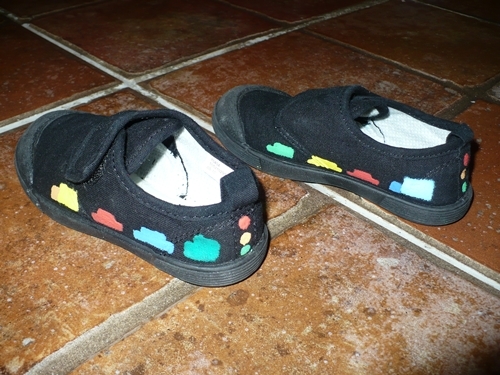 what fun way to jazz up sneakers/shoes! 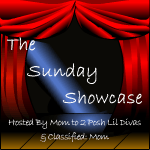 Thanks for sharing your fun with us on the Sunday Showcase. We hope to see you link up what you’ve been up to this week. this isnt what i wanted, i wanted some with pictures to paint mine. these ones are realy good but there not my kind. 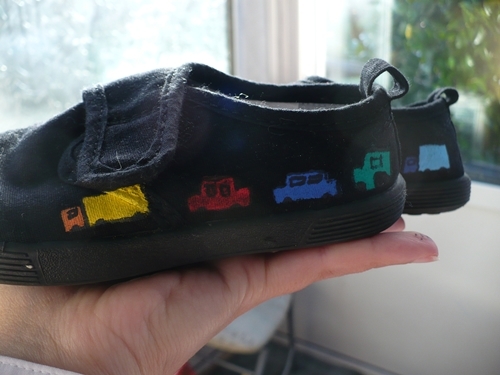 Excellent, my little girls starts nursery this week and i too want to jazz up her plain black plimsolls! You’ve given me just the idea – thank you!!! !